Wednesday 12. October 2016 - At the recent Tecnargilla tradeshow in Rimini, Italy, Electronics For Imaging, Inc. (Nasdaq:EFII) presented the distinct advantages available to the ceramics and home décor industries with its complete, advanced ecosystem of EFI Cretaprint technologies. Visitors witnessed the latest EFI Cretaprint printers and Genuine EFI Cretacolor Inks, along with advanced EFI Fiery digital front end (DFE) technology for digital production workflows. EFI also presented the high-quality digital ceramic tile decoration capabilities the EFI Cretaprint ecosystem offers with a showroom display at the recent Cersaie 2016 tradeshow in Bologna. Making its debut at Tecnargilla was the new EFI Cretaprint D4 printer, which features up to 12 print bars. The printer fulfils the most demanding tile decoration needs by giving users the ability to incorporate a full range of ceramic inks and digital print effects. A newly upgraded EFI Cretaprint C4 printer running at the show featured the just-released Xaar 2001 printhead. The C4 model is designed for ease-of-use, lower maintenance costs and energy savings. The new, optional Xaar printheads have 2,000 nozzles per head and deliver bold colours and special effects for high-coverage projects in an advanced Cretaprint platform that can print at resolutions up to 720 dpi and at speeds up to 50 metres per minute. Another printer shown on EFI’s Tecnargilla stand, the Cretaprint M4-SOL, is the most popular model of EFI Cretaprint’s SOL series of printers available in widths from 700mm to 1800mm. Specifically designed for producing high-transit, porcelain-polished tiles, the printer gives users the ability to jet soluble-salt inks and bring richer colours to their porcelain tile decorations with lapatto and polished finishes. 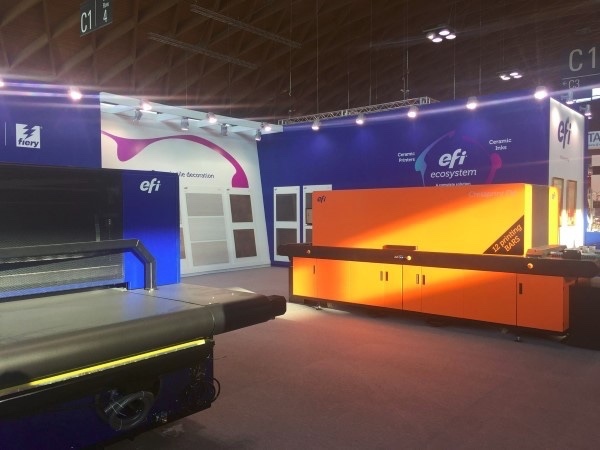 For the first time at a ceramics tradeshow, EFI presented an LED UV-inkjet, wide-format solution for tile decoration – the EFI H1625 LED, a 1.65-metre wide printer. The EFI H1625’s LED UV-curable inks provide superb photorealism and vibrancy to customised, ceramic coating jobs. Users can move beyond traditional limitations in ceramic tile home décor imaging, printing one-off or short-run pictures and high-resolution images on conventional ceramic pieces and offering the higher-end quality common in graphic display imaging applications. EFI also highlighted Cretaprint X4, the company’s innovative, award-winning technology for new, larger slab lines. The new technology brings advanced, smart functions for optimising and customising ceramics for architectural projects, including facades, flooring, panelling and countertops. EFI Fiery DFE technologies and Genuine EFI Cretacolor Inks bolster the EFI Cretaprint ecosystem for ceramic decoration printers, ink and colour management. The latest EFI Fiery proServer DFE presented at Tecnargilla provides highly accurate and predictable results, with the lowest ink costs. Users benefit from improved colour management tools, plus the proServer’s unique Smart Ink Saving feature incorporates users’ actual ink costs to calculate the most affordable ink combination possible for each pixel of a design. 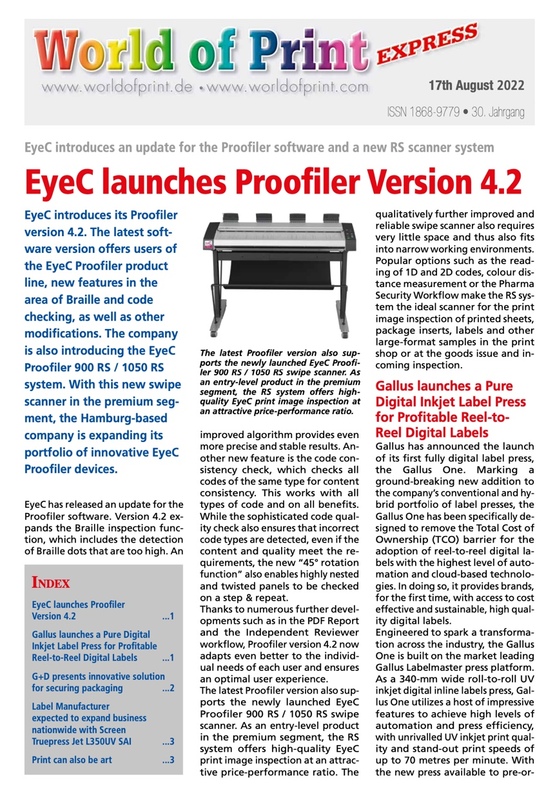 The EFI Fiery proServer’s industry-leading capabilities also help customers address Industry 4.0 initiatives for automated tile manufacturing, serving as a core integration piece to connect digital decoration with other, plant-wide systems and processes. Genuine EFI Cretacolor Inks used in the Cretaprint printers at Tecnargilla are formulated to deliver the highest quality and optimal performance. At the show, EFI presented for the first time its newest colour addition to Cretacolor Inks, a new Green ink that significantly expands the available colour gamut for customers. Combined with Cretaprint printers and the Fiery proServer, the inks help users achieve maximum colour intensity and gamut, chromatic range and colour stability over time, and uniformity throughout the manufacturing line. Cretacolor inks are odourless, stable and non-hazardous, and offer a long shelf life of eight months from the date of manufacture. Concurrent with the Tecnargilla exhibit, EFI also showcased the advanced technical productions capabilities of the Cretaprint ecosystem with its installation of high-end, digitally printed custom décor tile applications at Cersaie, the international exhibition of ceramic tile and bathroom furnishings held at Bologna Exhibition Centre.